Cupbop’s Combo Bowl delivers Cupbop’s best facets—barbecued meat, potato noodles and rice—with a nice balance of sweet and spicy! Just like that working-class, alt-country outfit that you’d find playing at Kilby Court on a Wednesday night, food trucks deliver their goods with honesty and enthusiasm—which is what makes them so attractive. After driving all over the Wasatch Front to track down the subjects of this article, I couldn’t help but feel a kinship with the rabid fans of Stillwater in Cameron Crowe’s film Almost Famous. Over the course of a week, SLUG checked out four local food trucks, each of which offered a unique culinary perspective. It was during an afternoon lunch rush that I visited Bento Truck on the U of U campus. I ordered a combo bowl—Teriyaki Chicken and Fried Tofu ($6.50) along with a side of Shumai ($2), which are lovely, deep-fried balls of ground shrimp. The Teriyaki Chicken was tasty—despite its tendency to show up on every Asian-inspired menu—as Bento Truck manages to infuse some life into the dish. My favorite was the Fried Tofu, which had a nice outer chewiness that gave way to a silky interior. The rice and veggies were OK—I was hoping for more of the garlic and ginger flavors that are characteristic of stir-fry. The Shumai were surprising little pops of flavor that I really enjoyed. It looked like they were cloaked in a wonton wrapper, which added a bit of chewy texture to the shrimp balls. At only 2 bucks, they’re a great side dish. Bento Truck is great at offering substantial portions at reasonable prices—which is likely why they crush it during lunchtime at the U. During my first visit to Cupbop, I wasn’t quite sure which direction to take. Their menu offers four different options, and they all sounded delicious. Luckily, the Combo Bowl ($8) let me try them all. After ordering, it’s time to pick the level of heat that you want to add, on a scale of 1 to 10. I’m a fan of spicy food, but I also didn’t want my overconfidence to punish me later, so I went with a level 7. 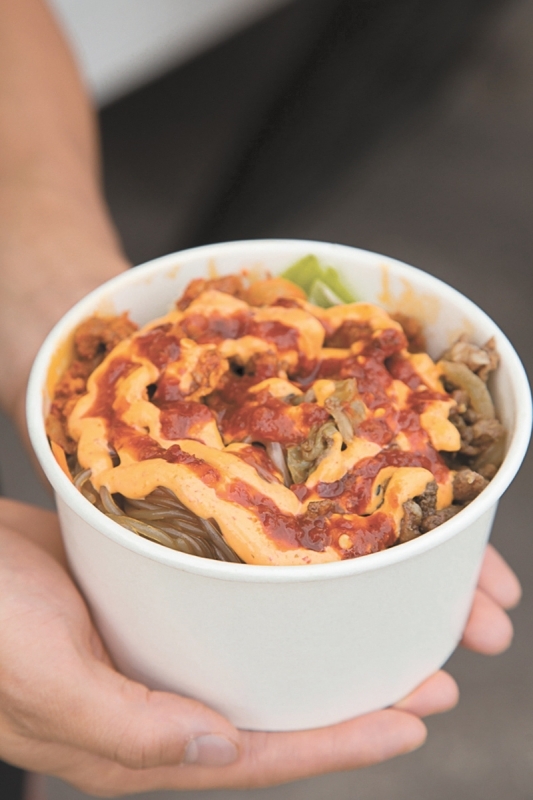 My first few bites into the glorious pile of barbecued meat, tender sweet potato noodles and fluffy rice struck a nice balance between the earthy, slightly sweet meat and the spicy sauces. I also tried the barbecued chicken in the strangely named KKO KKO Bowl ($7.50) at the first level of spiciness. The chicken was moist and juicy, but I thought the dish needed some of that spicy mayo to kick the flavors into high gear—my recommendation is to not settle for anything below level five. 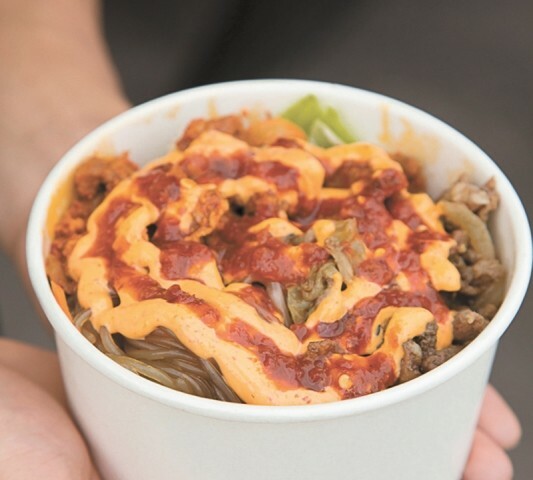 It’s the chemistry between Cupbop’s grilled meat and homemade hot sauce that makes this food truck worth a visit. Grub Truck’s whole menu is a love letter to the versatility of the taco. Once again, I wanted to try everything, so I went for a menu item known as Three Amigos ($8). The Three Amigos is a plate piled high with three varieties of their tacos, and since they had four to choose from, I paid the extra three bucks to get them all. The best of the bunch was the Korean Taco ($7 full size). Taking their own spicy mayo and adding it to a taco with barbecued beef, roasted broccoli and brown rice was an excellent fusion between Korean and Mexican food. Next up was the Greek Taco ($6 full size), stuffed with chicken souvlaki, feta cheese and homemade tzatziki sauce. The tzatziki was creamy and brought just the right amount of cucumber flavor to the show. The Veggie Taco ($6 full size) was filled with roasted squash and zucchini and topped with that lovely tzatziki. The roasted veggies were a hearty meat substitute, but the flavors were very similar to the Greek Taco. The Thai Taco ($6 full size) was the one that fell just a bit flat for me. The chicken and slaw were tasty, but the peanut sauce didn’t deliver the Thai flavor that I was hoping for. Like many great innovations, the food at Off the Grid represents an idea that is so good that it’s a mystery as to why no one thought of it earlier. The idea in question is the food truck’s signature waffle sandwiches. Barbecue pulled pork and buffalo chicken just aren’t the same after you’ve had them served between two perfect, golden-brown waffles. The local favorite is a sandwich called the Bee’s Cheese ($6). It begins with Off the Grid’s signature waffles—crispy on the outside, chewy on the inside and kissed with a hint of sweetness. With the Bee’s Cheese, these waffles have a crunchy parmesan crust and are hugging a few melty slices of Beehive Cheese’s cheddar. For a buck more, they’ll add pulled pork or buffalo chicken, which was a deal too good to pass up. I went with the buffalo chicken and was surprised to find generously portioned slices of chicken breast slathered in a well-balanced buffalo sauce. It’s a great achievement in the history of sandwiches. The parmesan crust and the natural crispness of the waffle worked well texturally, especially when the gooey cheese was involved. For more Utah Food trucks, check out Food Truck Thursday at Gallivan Plaza from 11 a.m.–2 p.m. at 62 Gallivan Ave.—but do try to pace yourself.